Wanting to join in, but not sure how to go about getting started? The best place to go for information is www.classroombookaday.com, where I've compiled links to blog posts I've written, a podcast I did, and slideshows from the presentations I've done. I also figured it might be time for an overview post for those looking to get started with some basic information, explanation of the purpose, and logistical tips. #classroombookaday is a goal (some call it a challenge) to share a picture book read aloud every day of the school year. At any grade level. Who started it? And why? Me! :) Jillian Heise (@heisereads on twitter & instagram), when I was teaching 7th & 8th grade ELA. I was thinking about how to ensure I would read more picture books with my students. I knew the impact of Donalyn Miller's #bookaday challenge on my own reading life in the summer, and how it helped me read more and thought there could be a way to bring that into the classroom. I also knew that if I made it an official goal, I might be able to stick with it. But, mostly, I wanted to bring a joy of the reading experience back into my classroom. We tend to stop reading aloud to kids once they hit a certain age, and that is a shame. And over 170 picture books shared?! I figured that would have to make an impact. Though I had no idea then what an impact it would ultimately have. I knew I wanted to bring the #bookaday mindset into my classes the next year through a commitment to reading aloud a picture book each day. And I wanted to display covers or titles in the order we read them each day as a way to track it visually. So on September 1, 2014, what would ultimately become #classroombookaday began in my middle school classroom with My Teacher is a Monster! (No, I Am Not.)! 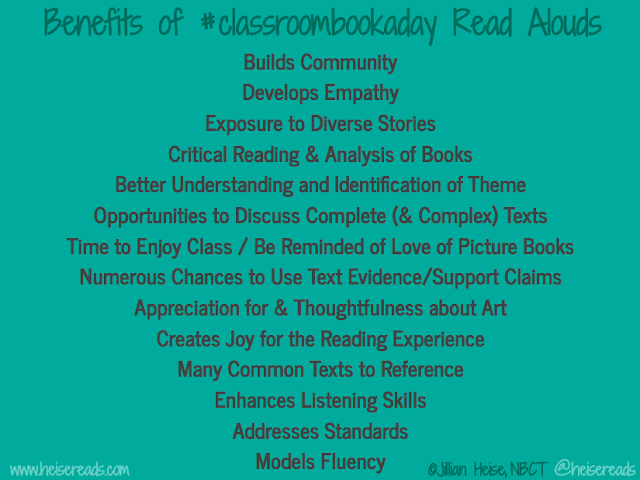 In August of 2015, after more educators wanted to join in and try it, I coined #classroombookaday as a separate hashtag from #bookaday in order to track the conversations on twitter about picture books we were using. Evidence of the origin! Doesn't everyone send themselves emails at school with ideas of things they want to implement? Make the commitment to do it. Carve out 5-10 minutes in your day or class period that you can dedicate to doing a read aloud. Whether at the start of a class period, during your morning meeting, at the end of the day after packing up, or before/after a break, make this sacred time as part of your daily routine. Tell someone about your goal so you'll be more likely to stick with it. Pull some favorite picture books to start with. Decide on a display that works for your space and style where you can track your reading year visually. Get buy-in from your students - tell them about the goal and why you're doing it. 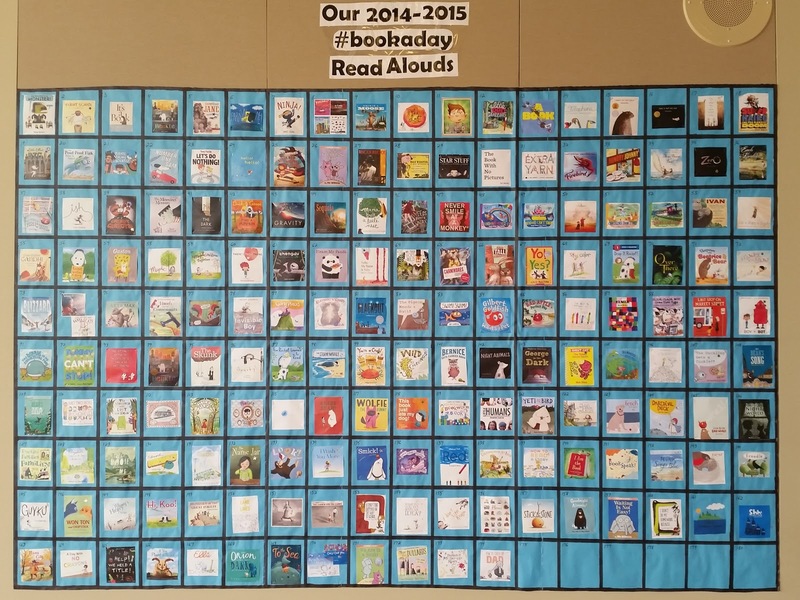 Share your read alouds as part of the #classroombookaday community on twitter, instagram, or facebook. Why should I use precious minutes in our school day to do this? There were more benefits from this time than I imagined when I first had the idea to start it. 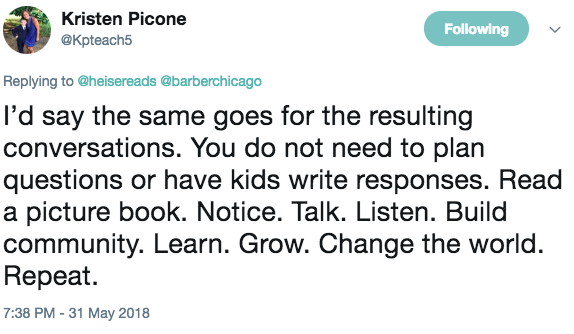 The power of having 180 common experiences with text that we could refer back to was more valuable than anything else I could have used that time for. And the impact on our classroom community went far beyond my expectations. 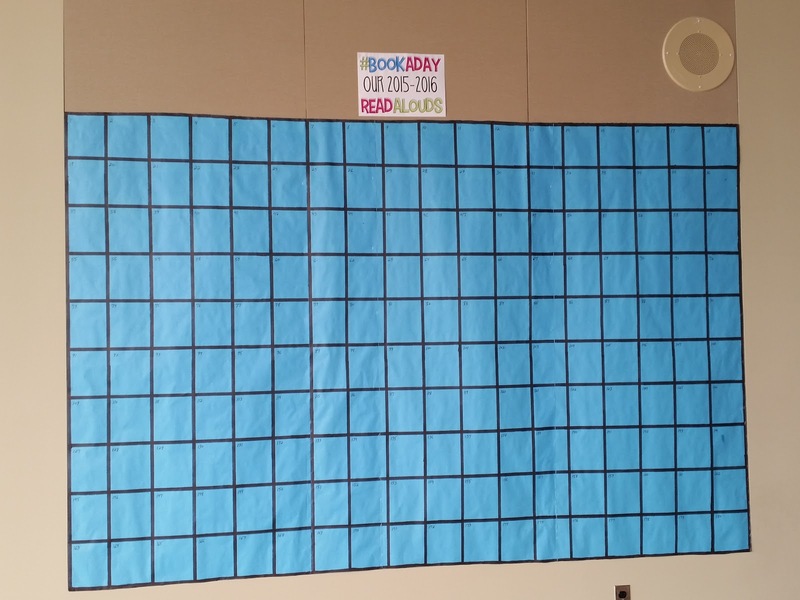 Who all is doing #classroombookaday? Teachers from grades 1-12. Librarians. Reading Teachers. Instructional Coaches. Principals. It can happen in any situation you're in at a school, at all grade levels. Those not in a classroom have sometimes adopted a class to be a daily guest. And one school did a K-8 school-wide version this year with the entire school reading the same books each week at every grade level. What's the deal with the display? I knew I wanted to track the books we read visually. And I wanted to make my goal public (so I couldn't back out or let it fall by the wayside as the year got busy! ), and I had a huge bulletin board space in the hallway. I had the idea to make a numbered grid with a square for each day of the year so we could track as we went, and also see how many more we had to go. 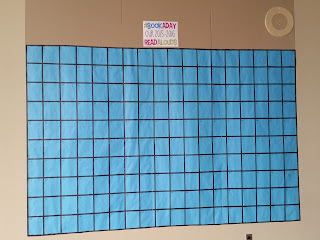 I was already tracking my novels read each year visually on my classroom door, which would lead to conversations, impromptu book talks, and a way for me to remember what books I had read. I wanted to bring that to the #bookaday reads. Here we go! Can't back out now! Ready for a year of #classroombookaday. 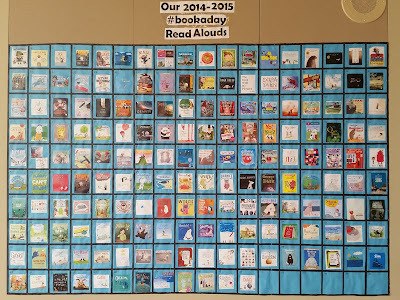 This was the first year trying #bookaday picture book read alouds, and start of what would become #classroombookaday! Many variations of the display exist in classrooms and schools across the country. You can see examples on twitter, instagram, or in the facebook group. Important note: The books and the reading matter more than the display! This was never about trying to make something that looked "pinterest perfect", although the picture book covers make a great way to decorate, but this was really about having a visual reference of the goal and record for my students. We often used and referred back to the display to discuss books we had shared. I measured my space so I knew the size that would fit, and copied book covers from goodreads 4 to a page in a doc or slide, then printed weekly when I planned ahead. Sometimes I printed the day of when I changed my mind or didn't plan as far ahead. Haha. I was lucky to have a color printer at school to use. Find a space you have that works: some put it in the weirdly sized space outside their door, some wrap it around the room as part of their number line, some don't put them in order, some hang them from clips, some put them on cabinet doors, some hang them from the ceiling, some can only print in black and white, some have their kids put the pic up each day. Don't stress about the display - make it work for you and your space and how much effort you want to put in! It happens. We all work in schools and know the importance of being flexible. Fire drills, field trips, inflexible deadlines, unexpected things pop up. Just double (or triple or quadruple) up another day to make it up! Is there a lesson that goes with it? Nope. Not at the time of the read aloud. This was first and foremost about enjoyment and thoughtfulness. Bringing some of the joy back into the classroom. Bringing some of the appreciation of story back into the classroom. Bringing some of the validation of picture books as a format (not age level identifier!) back into the classroom. And I wanted to keep it as a quick time in the class period. With that said, since we have that experience with a common text, any of the 180 titles could be brought back into the discussion for related lessons and activities at other times in the class. Sage advice/perspective. 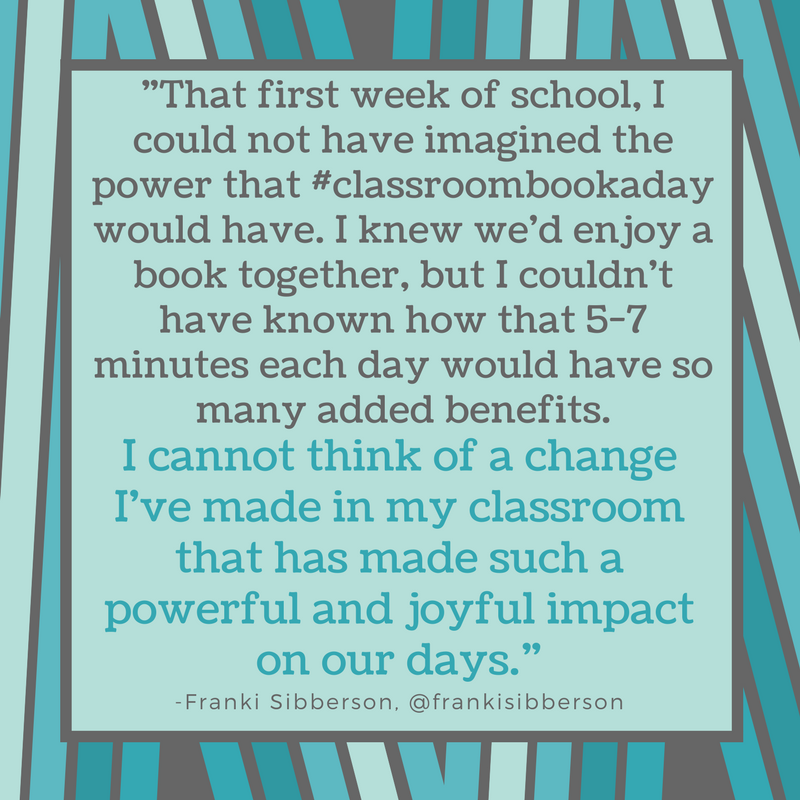 Love this perspective on the power of letting #classroombookaday grow organically! What do I do with the books each day? Read them for the pure enjoyment of story and shared community experience. Because one of my intentions was joyfulness: Let the kids settle in however they want to (though I do require they position themselves so they can see the illustrations - that's part of the point of picture books). Even my middle schoolers commented on how sitting on the floor and being read to again brought them back to their childhood and let them "feel like a kid again" in the midst of all of the harder work they have to do every day. I did my read aloud at the start of class after independent reading, and it worked as a calming factor also. Because one of my intentions was thoughtfulness: The first question I always asked after I finished was "What did you think?" As I went through the first year, a month in I started to focus on theme, asking not just what the story was about (because they wanted to summarize), but "What was it really about?" Due to having shared more than 100 fiction texts for which we could discuss theme, my students learned and understood theme better than any other year or way I had tried to teach it. They understood that there is not one right answer to a theme for a story (though there can be wrong ones). As long as they could defend their perspective with text evidence, they could form an opinion and argue their case. It validated their voices and deepened their understanding daily. Is there a list of books I should use? Nope. And you shouldn't plan to go into it with all of your books already chosen. 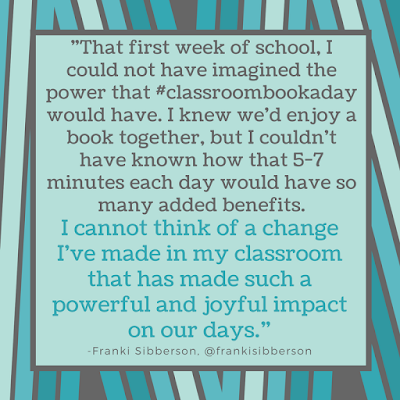 The most impactful part of #classroombookaday is how responsive it can be to your classroom community and students' needs. Choose your favorites, new titles that you've been hearing about, curriculum tie-ins, ones that you want student opinions on, award winners, or just plain fun reads. 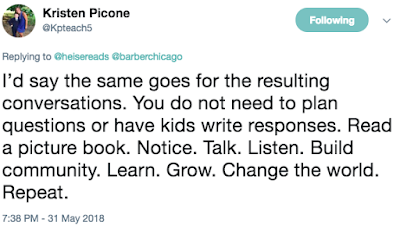 Base it on what you and your students or school community need at that time. Sure, for certain units I had a clearer plan than other times if I wanted more direct tie-ins, but prepare to be responsive for the community aspect also. I'm always looking to improve the balance of books I select. Recently my focus has been increasing the expository non-fiction and a wider diversification of authors and characters to better represent the our community. What about a list of books for 6th/7th/8th grade? Nope. Not one of those either. You need to read A LOT and find the ones that you think will be a fit for your community. And you won't guess right every time. Some will flop, and that's ok. You'll get to know your kids better, and they will have a voice. Every picture book won't work for every student or every class, and some will work one year and not the next. Let your students have a voice - they'll tell you. I had a few I thought my students would love, and they didn't. And some I thought they wouldn't, because they might be too young, they loved. For some they told me to donate to the 2nd grade classroom, and when they could give their reasoning for why, I knew they were learning to be critical readers and able to defend their points. And your kids might surprise you and connect with books for reasons you don't expect. You have 180 chances to try a book, it's ok if a few don't work. Where can I go for book recommendations? My slideshows from presentations I've given have several slides of recommended titles. #pb10for10 & #nfpb10for10, created by Cathy Mere & Mandy Robek where educators share top 10 book lists on various themes each August & February. and join in the #classroombookaday community. or reach out via twitter.